​​Normally, just the mention of the name ‘Facebook’ induces fear in many teachers, particularly SLT. We’ve all heard the stories of how teachers have fallen foul of websites such as Facebook and MySpace with some extreme cases resulting in dismissal. However, with some simple precautions, Facebook can be a powerful tool for connecting and sharing with other educators. By far the simplest way to become connected on Facebook is to become friends with other educators. Join education groups – As well as being a great place to find and share great resources/ideas, education related Facebook groups are also a great place to find and connect with other educators. Groups can be found by using Facebooks built-in search facility. Click on the search icon (top right hand corner of the Facebook toolbar) and type in a keyword e.g. ‘Education’ + ‘Teachers’ etc. Facebook will return a list of results based on your keywords. Once here, you can refine your search by clicking on the ‘Groups’ link. Visit education blogs – Many teachers who blog also tend to be active on other social media platforms such as Twitter, Facebook, Pinterest etc. When visiting a teacher’s blogs, look out for the Facebook icon or ‘Add me to your PLN’ section. Join the Staffrm – The Staffrm (www.Staffrm.io) is a great place to find other educators on Facebook. Clicking on a teacher’s profile in the Staffrm will take you to their ‘Profolio’ (a kind of professional portfolio for educators). Here you will find, if they have one, a link to their education Facebook account. Follow education related Facebook pages - Pages are ideal for sharing educational resources/best practice but they’re also a great place to find other educators. Once you’ve found an edu page, simply scroll through the posts to find comments from other educators. Create a Teacher profile - Creating a separate profile for teaching is an easy way to separate your professional and personal life on Facebook. If using Facebook in the classroom, it will also prevent students from seeing your personal information. Create an education Facebook page – Facebook pages are essentially separate profiles, separate from your personal account, which allow you to collate and share resources making them perfect for sharing classroom resources! Make sure your settings are set to private – This is something we often tell our students but is sometimes neglected by teachers. If you’re going to use your personal profile to connect with other educators on Facebook, and I see this quite a lot, make sure you have your account set to friends only. This can help avoid potentially embarrassing/awkward interactions. 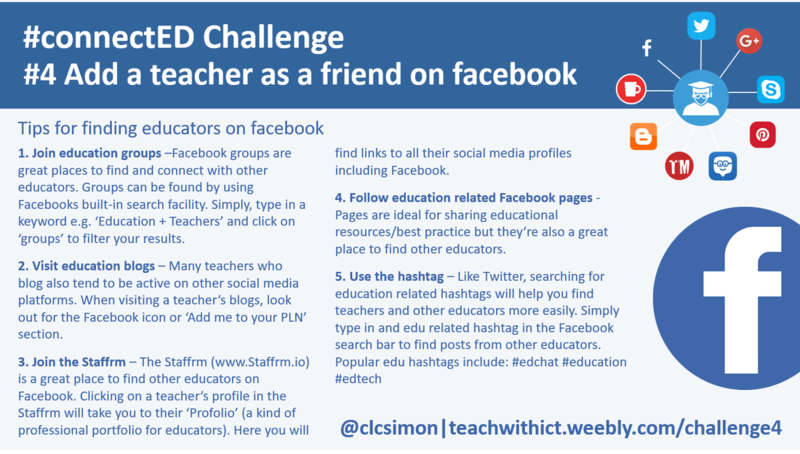 http://www.edudemic.com/every-teachers-must-have-guide-to-facebook/ - Useful guide for any teacher who uses Facebook. http://teachwithict.weebly.com/tips-for-staying-safe-on-facebook.html - Tips for using Facebook safely. 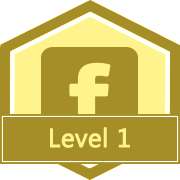 http://www.facebook.com/education - A Facebook page for information about how educators can best use Facebook. https://www.facebook.com/help/325807937506242/ - Facebook help centre containing guides for managing your privacy settings. https://www.scribd.com/doc/16957158/Teacher-s-Guide-to-Using-Facebook-Read-Fullscreen - A teacher's guide to Facebook by Bernadette Rego.